Love casino card games? Blackjack, Baccarat, and Casino War aren’t the only games in town. At Silver Oak Casino, and at casinos that dot Las Vegas Boulevard, a little game called Vegas Three Card Rummy is captivating minds and crowning winners. Some call it insanely addictive. We call it the most magical casino card game ever. Read on to see why we’ve made such a bold claim. If you’ve never played Vegas Three Card Rummy, the objective is simple. You want to have fewer points than the dealer. You can think of Vegas Three Card Rummy as golf, where a lower score is ideal. Here’s how it works. The dealer will start by shuffle a 52-card deck. Online, this is done automatically. You’ll then place your ante bet. Hit the Deal button and you’ll be dealt three cards, all face up for the world to see. The daler gets three card, but face down. 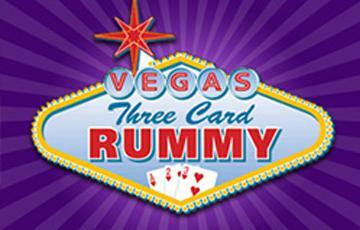 Unlike Blackjack where one card is visible, Vegas Three Card Rummy keeps things hidden. Now it’s time to calculate your hand. But it’s not as simple as adding up your hand values. Pairs, 3-of-a-kind, and straight runs with at least 2 suited cards count as zero points. Single cards have their own value, with 2-9 coming in at face value, Aces coming in at 1 point, and all other cards valued at 10 points. With your hand calculated, you now have a decision to make. You can either raise or fold. If you fold, your ante is surrendered. If you raise, you need to match your ante bet. Now it’s time to see who wins. First, you need to find out if the dealer qualifies. He needs 20 points or less to qualify, based on the same point calculation you used. If he doesn’t qualify, ante bets will receive even money and any raises will push (that means you tie). Looks simple? It is. But today we’re going to tell you how to maximize your payout potential. In Vegas Three Card Rummy, you only really have two decisions to make. You can either raise or fold. So how do you know when to do what? Well, according to Vegas Three Card Rummy experts, the magic happens when you raise with a total of 20 points or less and fold with a total of 21 or more. That can essentially reduce the house edge to as low as 3.2%. If you’ve never tried Three Card Rummy, now is the time. You can play for free at Silver Oak Casino right now. All it takes is a free account, so get started and discover why there’s no game quite like it.